When my Mom was cleaning out my grandmother’s house, I asked if I could have the slipper chair. 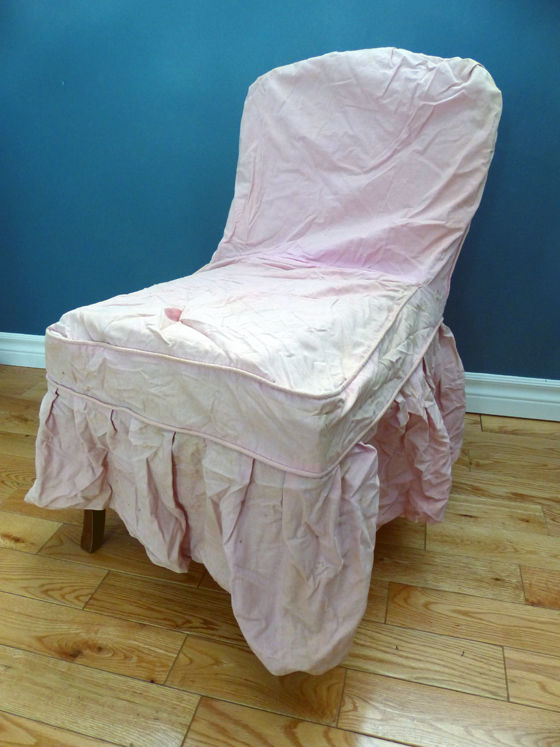 When my Mom showed up with a pink skirted chair, I was surprised. I actually didn’t remember ever having seen this chair before. 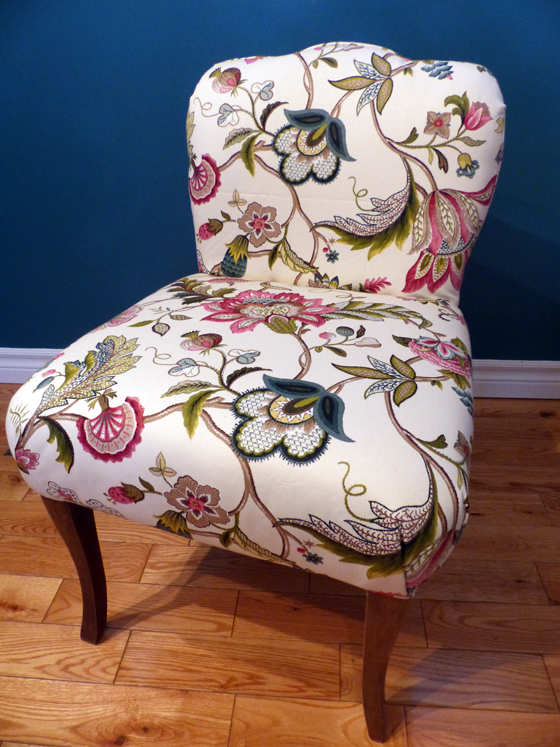 The “slipper” chair I had in mind was a parson’s chair that had sat in my grandmother’s front hall. 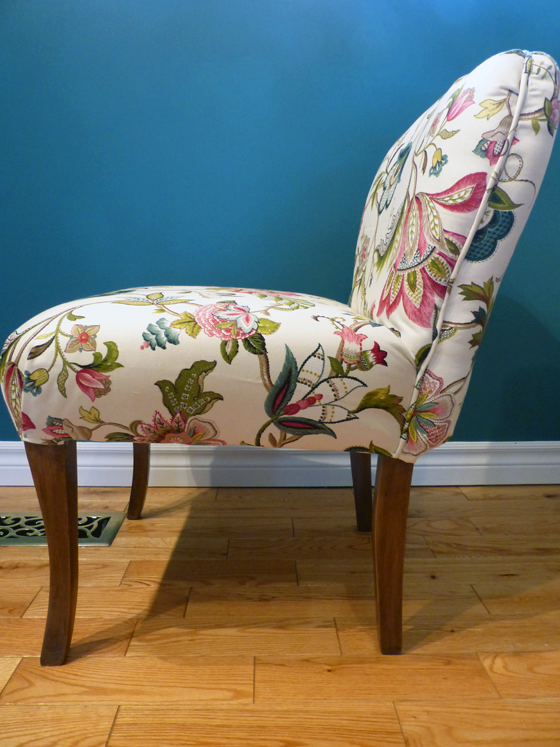 I ended up with that chair too–in fact it turned out to be one of a pair and I got them both in addition to the little pink slipper chair. Yes, I have a thing for chairs. 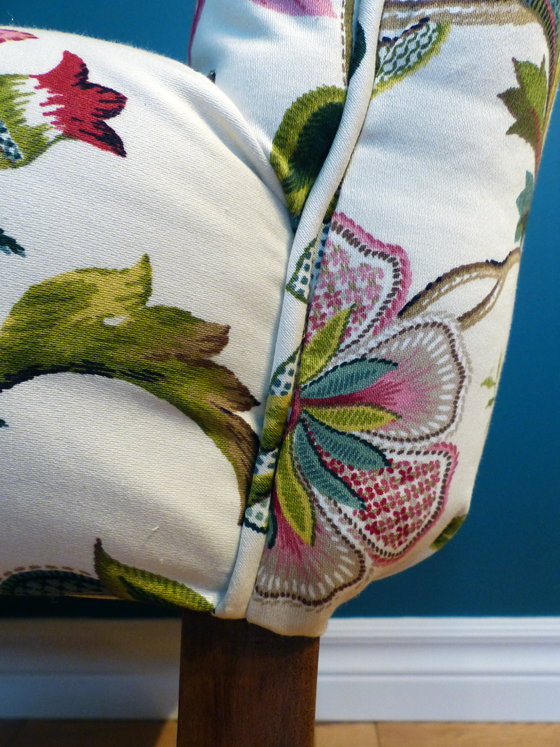 I’ve always envisioned the slipper chair being part of my office, so now that that makeover is underway, it was finally time to give the slipper chair a new life. This was a totally start from scratch scenario. 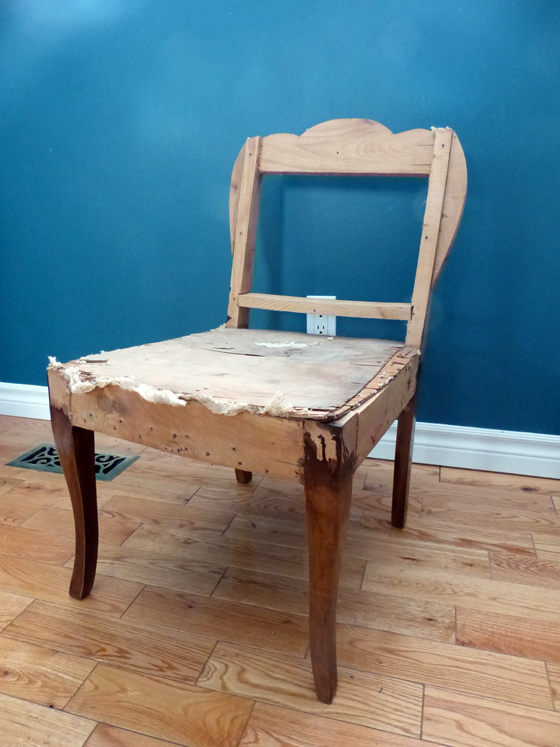 I had the wood frame of the chair and that was it. This was also a totally make it up as I go scenario. 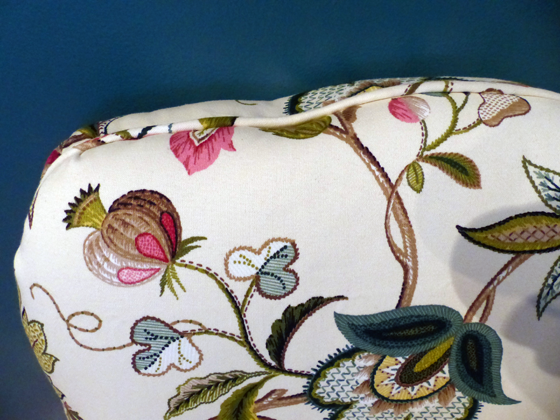 I am not experienced in upholstery and am–like many people–a bit intimidated by it. So I just dove in. I stained the legs to a dark brown. 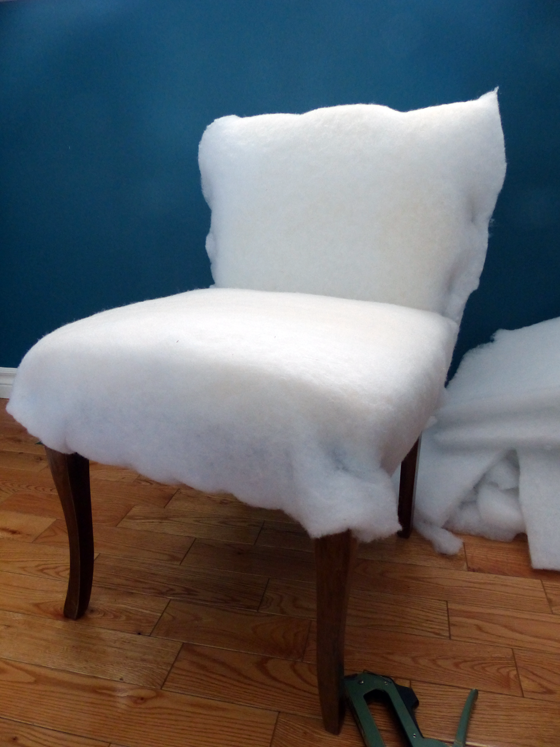 I covered the seat with some foam, and then put more foam on the back. I covered it all with batting, mashing it around the corners. I stapled, stapled and stapled. Then I covered it all with an old sheet, stapling the heck out of every fold. Then things got serious. 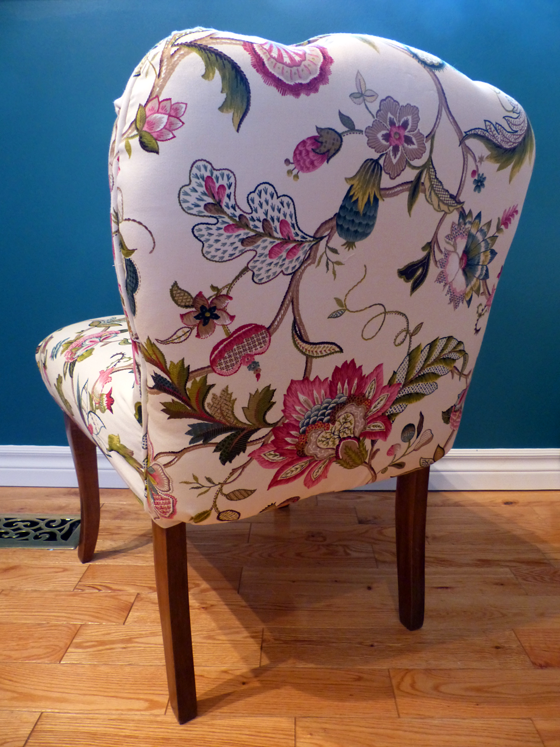 I pulled out my bolt of Brissac Jewel fabric that I’ve had for longer than I’ve had the chair. There was lots of laying things out, turning them around, laying them out again, putting them back to the exact way they were before. And then doing it all over again. Once I finally figured out how to place the fabric, I then spent a lot of time stuffing material around the legs and trying to get the folds just right–or right enough. I made my own piping and used flexible metal tack strip (plygrip) for the first time (this video was very helpful). I built my grip strength using my vintage manual staple gun–seriously, I’m almost ready for American Ninja Warrior. My fingertips are still tender. 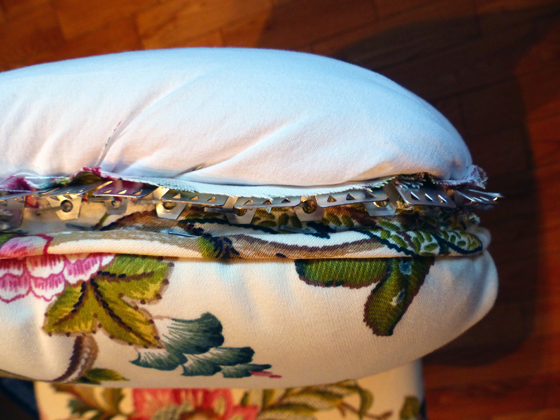 If I take on more upholstery, I would invest in an air powered staple gun. 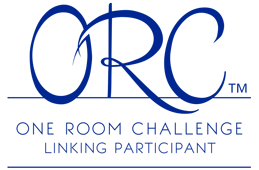 However, a project like this can be done with very basic tools–and very basic skills. 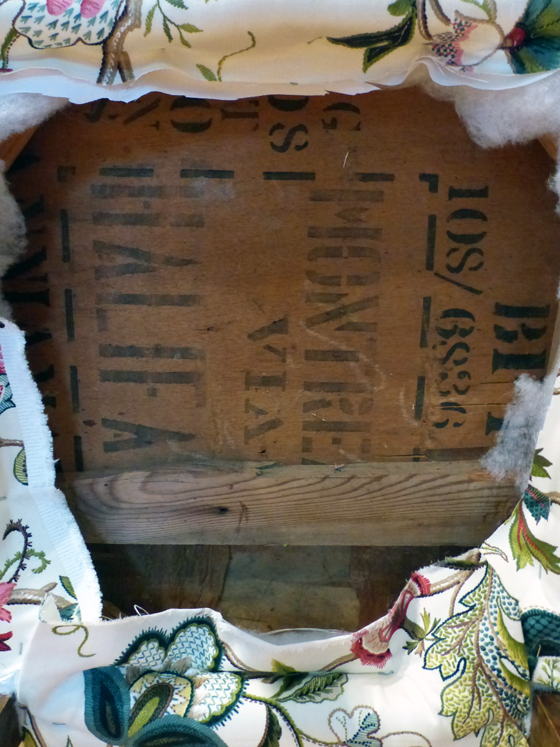 I covered up the messy underside with another piece of the sheet (although the packing crate that was used for the seat is pretty cool–I wonder what went to Montreal via Halifax). My grandmother grew up in her family’s furniture store and reupholstered furniture regularly. 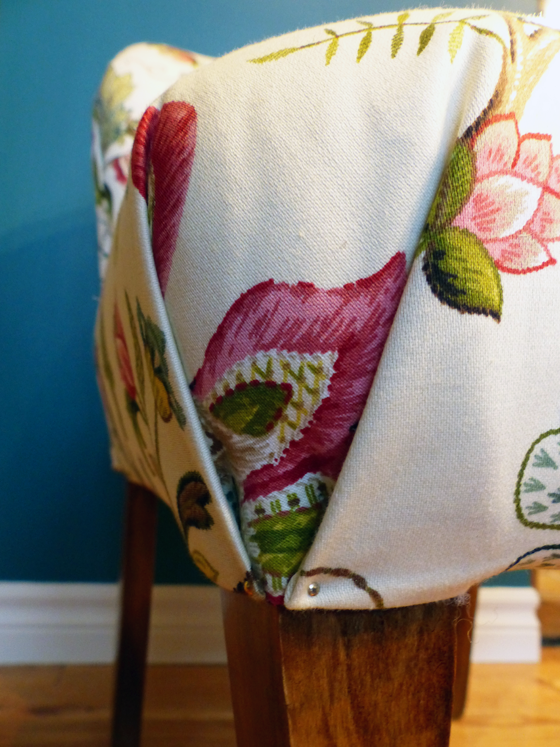 She made the pink slip cover that was on the slipper chair originally. All I could think as I was working on this chair was that she would definitely have something to say about my technique if she was around. And I wish she was around to tell me how to do it right. Right or wrong, though, it turned out pretty well. I can see the few flaws, but overall, I’m really proud. I think my grandmother would be too. What a beautiful chair! Love the fabric and it looks so comfy. Is there anything you can’t do!!! Your grandmother would be proud. 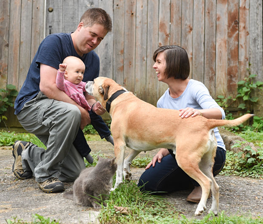 Aw. That means a lot. Thanks so much. I agree, your grandmother would be proud, you did an excellent job. 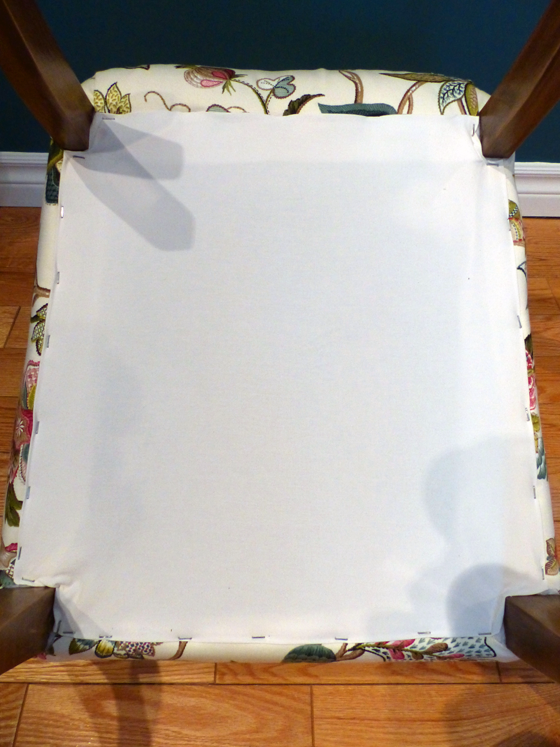 I have stapled batting and fabric to the seat only of a chair but that is about as complicated upholstery that I have tried to tackle. Your piping looks great! That’s where I started, Sarah. When we first moved here I updated our dining room chairs. I felt like that gave me some confidence to tackle this chair. It looks lovely, and very comfortable! I love that fabric. 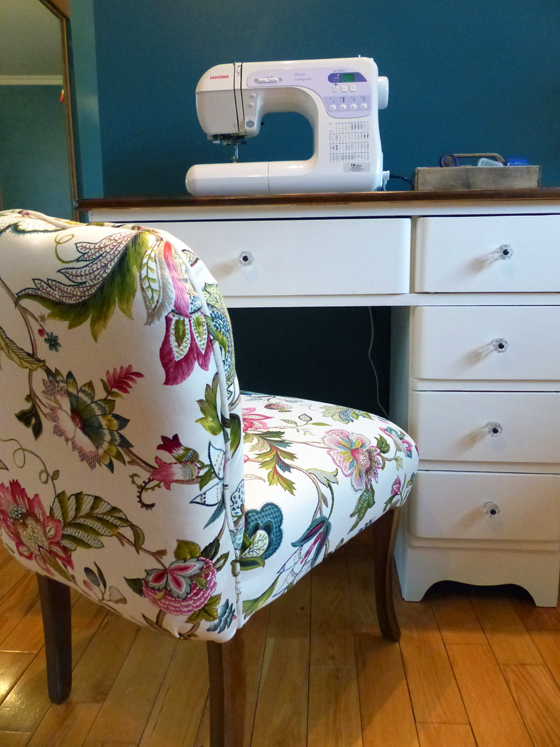 Is the chair high enough for you to sit and sew? It doesn’t look very tall. I reupholstered a chair for my stepdaughter for Christmas one year – royal blue legs and arms and zebra fabric, her faves. I bought an electric stapler for that job and it was money well spent. 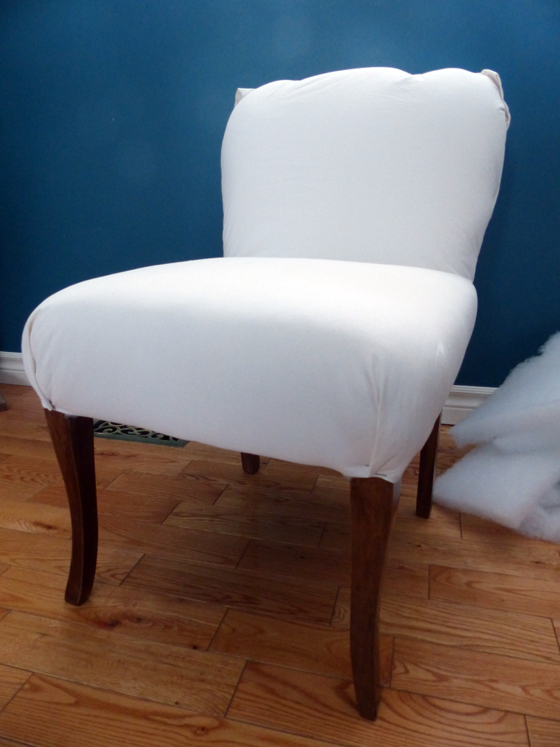 I was pleased with how the chair came out, it was my first foray into upholstering as well. I think your grandma would love it! It’s super cushy now. The chair itself is high enough, though the back is quite low. Your stepdaughter’s chair sounds very dramatic. I love that you made it so personal to her. That looks great, Julia! I love the piping!! Thanks Kristin. I’m really proud of this chair.